This article is about the Holland–Dozier–Holland song sung by The Supremes. For the Cliff Richard 1974 song "(You Keep Me) Hangin' On", see Cliff Richard discography. (1966) "You Keep Me Hangin' On"
(1966) "Love Is Here and Now You're Gone"
"You're Gone, But Always in My Heart"
"Going Down for the Third Time"
"Love is in Our Hearts"
"There's No Stopping Us Now"
"You Keep Me Hangin' On" is a 1966 song written and composed by Holland–Dozier–Holland. It first became a popular Billboard Hot 100 number one hit for the American Motown group the Supremes in late 1966. The rock band Vanilla Fudge covered the song a year later and had a top ten hit with their version. British pop singer Kim Wilde covered "You Keep Me Hangin' On" in 1986, bumping it back to number one on the Billboard Hot 100 in June 1987. The single reached number one by two different musical acts in America. In the first 32 years of the Billboard Hot 100 rock era, "You Keep Me Hangin' On" became one of only six songs to achieve this feat. In 1996, country music singer Reba McEntire's version reached number 2 on the US Billboard Hot Dance Club Play chart. Over the years, "You Keep Me Hangin' On" has been covered by various other artists including Lisa Hartman, Wilson Pickett, Rod Stewart, Colourbox, the Index and The Box Tops. "You Keep Me Hangin' On" was originally recorded in 1966 by the Supremes for the Motown label. The single is rooted in proto-funk and rhythm and blues, compared to the Supremes' previous single, "You Can't Hurry Love," which uses the call and response elements akin to gospel. The song's signature guitar part is said to have originated from a Morse code-like radio sound effect, typically used before a news announcement, heard by Lamont Dozier. Dozier collaborated with Brian and Eddie Holland to integrate the idea into a single. Many elements of the recording, including the guitars, the drums, and Diana Ross's vocals were multitracked, a production technique which was established and popularized concurrently by H-D-H and other premier producers of the 1960s such as Phil Spector (see Wall of Sound) and George Martin. H-D-H recorded the song in eight sessions with The Supremes and session band the Funk Brothers before settling on a version deemed suitable for the final release. "You Keep Me Hangin' On" was the first single taken from the Supremes' 1967 album The Supremes Sing Holland–Dozier–Holland. The song became the group's eighth number-one single when it topped the Billboard Hot 100 pop singles chart for two weeks in the United States from November 13, 1966, through November 27, 1966. It peaked at number 8 in the UK Singles Chart. The Supremes original version was ranked number 339 on Rolling Stone's The 500 Greatest Songs of All Time. It was voted number 43 on Detroit's 100 Greatest Songs, a Detroit Free Press poll in 2016. The track is one of the more oft-covered songs in the Supremes canon. They performed the song on the ABC variety program The Hollywood Palace on Saturday, October 29, 1966. Vanilla Fudge's 1967 psychedelic rock remake of "You Keep Me Hangin' On" reached number six on the Billboard Hot 100 chart a year after the release of the Supremes' recording. While the edited version released on the 45 RPM single was under three minutes long, the album version was 7:20. The recording, done in one take, was Vanilla Fudge's first single. That was Mark and Timmy. We used to slow songs down and listen to the lyrics and try to emulate what the lyrics were dictating. That one was a hurtin' song; it had a lot of emotion in it. "People Get Ready" was like a Gospel thing. "Eleanor Rigby" was sort of eerie and church-like ... like a horror movie kind of thing. If you listen to "Hangin' On" fast ... by the Supremes, it sounds very happy, but the lyrics aren't happy at all. If you lived through that situation, the lyrics are definitely not happy. A similar arrangement was used by Rod Stewart on his 1977 album Foot Loose & Fancy Free. This may have, in part, been the idea of Appice, who had by then joined Stewart's band. The Vanilla Fudge version appears in the series finale of the television show The Sopranos (2007), at the conclusion of Episode 1 of Season 7 of the show Mad Men (2015), the film War Dogs (2016), and the videogame Mafia III (2016). "You Keep Me Hangin' On" was covered in an updated version by British singer Kim Wilde in 1986. Wilde's version was a total re-working of the original, completely transforming the Supremes' Motown Sound into a hi-NRG song. She and her brother, producer Ricky Wilde, had not heard "You Keep Me Hangin' On" for several years when they decided to record it. The song was not a track they knew well, so they treated it as a new song, even slightly changing the original lyrics. It was released as the second single from Wilde's Another Step studio album (although "You Keep Me Hangin' On" was the LP's first worldwide single, as the first single had been released only in selected countries). The song became the biggest hit of Wilde's career, reaching number two in her home country, and number one in Australia. 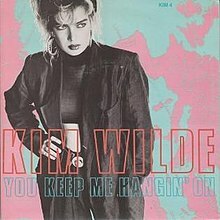 It also became Wilde's second and last Top 40 hit in the US following "Kids in America" and is also, to date, her most successful song in that country, reaching number one on the Billboard Hot 100 chart for one week in June 1987. It later ranked as the 34th biggest hit of 1987 on Billboard's Hot 100 year-end chart that year. "You Keep Me Hangin' On" was certified silver by the British Phonographic Industry for UK sales exceeding 250,000 copies. In 2006, she performed a new version of the song with the German singer Nena for her Never Say Never album. It has sold 265,000 copies in France. A music video was produced to promote her single. Directed by Greg Masuak, the video shows Wilde in a dark room lying on a large bed. She then rises from the bed as she sings the song and finds herself being "threatened" by a strange man who is breaking down the walls around her. (1996) "You Keep Me Hangin' On"
(1996) "The Fear of Being Alone"
Country music singer Reba McEntire covered the song in 1995 for her twenty-second studio album, Starting Over. Released as the album's fourth single in 1996 on MCA Nashville Records, it was co-produced by Tony Brown and Michael Omartian. Although not released to country radio, McEntire's rendition was her only dance hit, reaching number two on Hot Dance Club Play. ^ a b "You Keep Me Hangin' On". Rolling Stone. Archived from the original on 18 April 2014. Retrieved 4 November 2012. ^ "Billboard Hot 100". Billboard. Nielsen Company. 78 (47): 30. 1966. Retrieved 10 May 2011. ^ "Billboard Hot 100". Billboard. Nielsen Company. 78 (48): 26. 1966. Retrieved 10 May 2011. ^ "The RS 500 Greatest Songs of All Time". Rolling Stone. Archived from the original on 2009-04-03. Retrieved 2008-12-18. ^ Brian McCollum, "Detroit's 100 Greatest Songs" Archived 2017-08-29 at the Wayback Machine, Detroit Free Press, June 21, 2016. Retrieved 2016-06-21. ^ Host: Herb Alpert (29 October 1966). "Herb Alpert/The Supremes". The Hollywood Palace. Season 4. Episode 6. Hollywood. ABC. KABC. ^ "Top 100 Hits of 1966/Top 100 Songs of 1966". Musicoutfitters.com. Archived from the original on 2016-10-11. Retrieved 2016-09-30. ^ "The Vanilla Fudge* - You Keep Me Hanging On / Take Me For A Little While". Discogs. Archived from the original on 8 September 2017. Retrieved 8 September 2017. ^ Leeds, Sarene (April 13, 2014). "'Mad Men' Season Premiere Recap: Nowhere to Hide". Rolling Stone. Archived from the original on August 18, 2016. Retrieved July 23, 2016. ^ Amy Pitt, 25 Best 'Mad Men' Musical Moments Archived 2017-08-24 at the Wayback Machine, Rolling Stone, May 15, 2015. Retrieved 2017-06-14. ^ a b "BPI > Certified Awards > Search results for Kim Wilde (from bpi.co.uk)". Imgur.com. Archived from the original on 5 June 2016. Retrieved 1 May 2016. ^ Mason, Stewart. "Kim Wilde – Another Step". AllMusic. All Media Network. Archived from the original on 2 April 2015. Retrieved 31 March 2015. ^ Watson, Graeme (12 September 2013). "Kim Wilde Talks Pop, Parenthood and PVC". OutInPerth. Archived from the original on 2 April 2015. Retrieved 31 March 2015. ^ "Another Step-Kim Wilde". AllMusic. Archived from the original on 2011-10-05. Retrieved 2011-08-14. ^ a b "Official Charts > Kim Wilde". The Official UK Charts Company. Archived from the original on 5 March 2016. Retrieved 1 May 2016. ^ a b "Australian Top 50 Singles Chart – Week Ending 22nd February, 1987". Imgur.com. Archived from the original on 5 June 2016. Retrieved 1 May 2016. N.B. 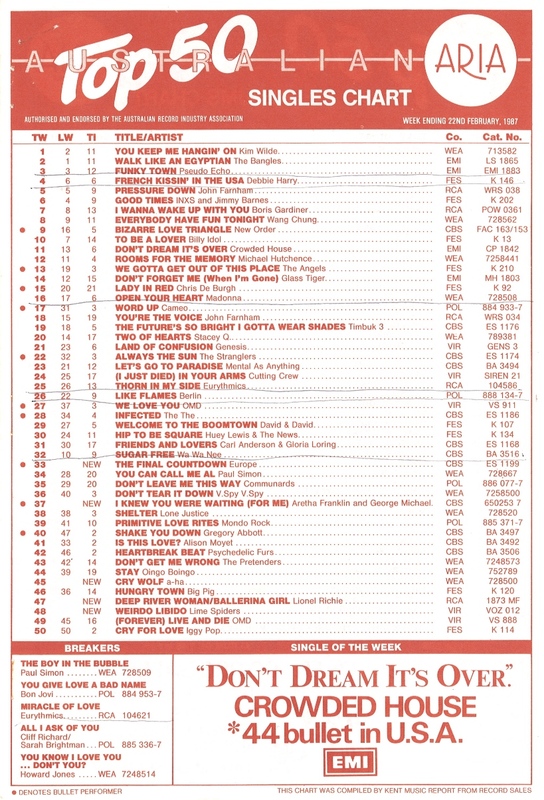 The Kent Report chart was licensed by ARIA between mid 1983 and 19 June 1988. 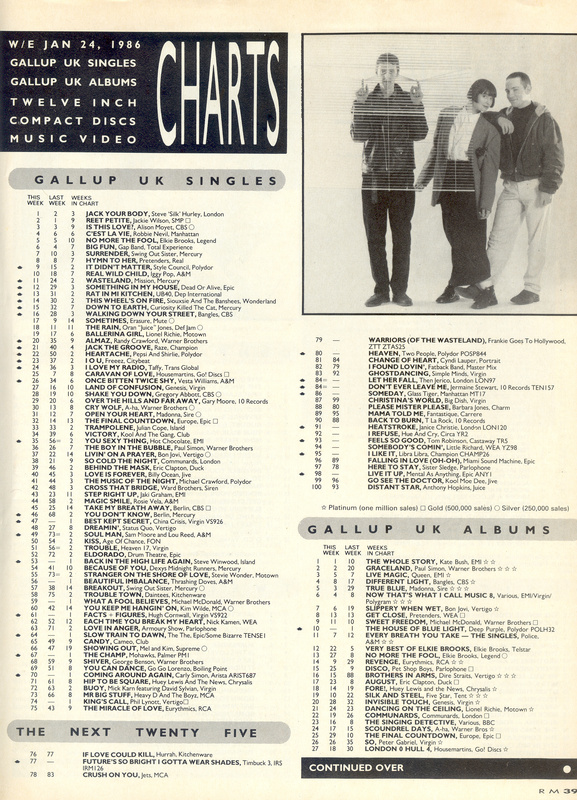 ^ "W/E Jan 24, 1986 (sic) – Gallup UK Singles Charts". Chartarchive.org. Archived from the original on 19 September 2016. Retrieved 1 May 2016. ^ Lesueur, InfoDisc, Daniel Lesueur, Dominic Durand,. "InfoDisc : Les Meilleurs Ventes de Chansons "Tout Temps" (45 T. / Cd Single / Téléchargement)". www.infodisc.fr. Archived from the original on 2017-10-10. ^ "Kim Wilde - You Keep Me Hangin' On". YouTube. Archived from the original on 18 March 2014. Retrieved 21 January 2014. ^ "You keep me hangin' on (music video)". Archived from the original on 8 September 2017. Retrieved 8 September 2017. ^ "Austriancharts.at – Kim Wilde – You Keep Me Hangin' On" (in German). Ö3 Austria Top 40. ^ "Danishcharts.com – Kim Wilde – You Keep Me Hangin' On". Tracklisten. ^ "Lescharts.com – Kim Wilde – You Keep Me Hangin' On" (in French). Les classement single. ^ "Offizielle Deutsche Charts > Kim Wilde – You Keep Me Hangin' On (single)" (in German). GfK Entertainment. Archived from the original on 14 April 2016. Retrieved 1 May 2016. 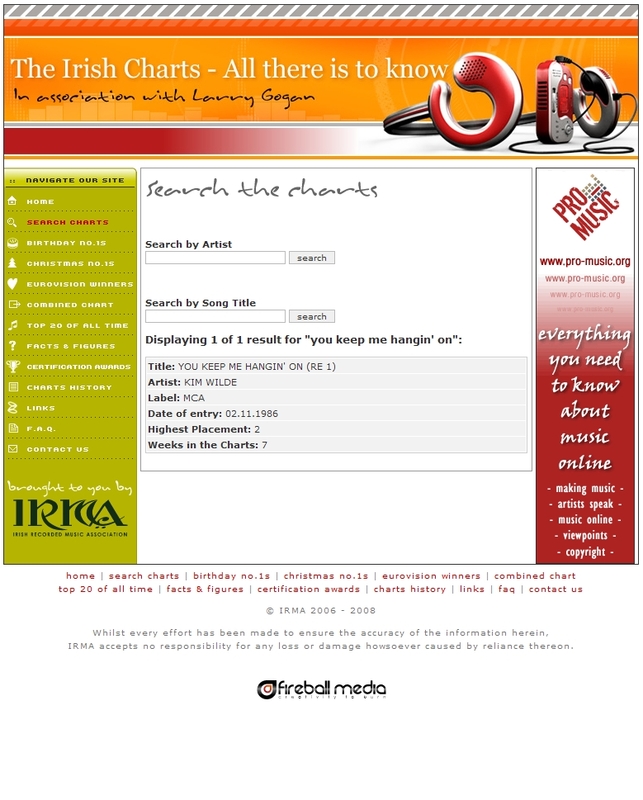 ^ "The Irish Charts – All there is to know > Search results for 'You Keep Me Hangin' On' (from irishcharts.ie)". Imgur.com. Archived from the original on 5 June 2016. Retrieved 1 May 2016. ^ "Dutchcharts.nl – Kim Wilde – You Keep Me Hangin' On" (in Dutch). Single Top 100. ^ "Norwegiancharts.com – Kim Wilde – You Keep Me Hangin' On". VG-lista. ^ "Swisscharts.com – Kim Wilde – You Keep Me Hangin' On". Swiss Singles Chart. ^ "Billboard > Artists / Kim Wilde > Chart History > The Hot 100". Billboard. Archived from the original on 4 August 2016. Retrieved 1 May 2016. ^ Kent, David (1993). Australian Chart Book 1970–1992 (Illustrated ed.). Sydney: Australian Chart Book. p. 439. ISBN 0-646-11917-6. ^ "Item Display - RPM - Library and Archives Canada". Collectionscanada.gc.ca. Archived from the original on 2017-07-30. Retrieved 2016-09-30. ^ "Top 100 Songs of 1987 - Billboard Year End Charts". Bobborst.com. Archived from the original on 2016-10-08. Retrieved 2016-09-30. "Another Step (Closer to You)"
"Say You Really Want Me"
"Love in the Natural Way"
"Can't Get Enough (Of Your Love)"
"The Night the Lights Went Out in Georgia"
"The Greatest Man I Never Knew"
"Why Haven't I Heard from You"
"She Thinks His Name Was John"
"Ring on Her Finger, Time on Her Hands"
"The Fear of Being Alone"
"How Was I to Know"
"I'd Rather Ride Around with You"
This page was last edited on 10 April 2019, at 01:49 (UTC).